Cinnamon and Jacob heard all the talk about the new gate and they wanted to go down into the tunnel and see it. 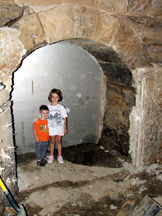 This is a photo from inside the mill – down in the tunnel. You can see the new gate behind the kids. It is stainless steal. bridgetonmill.com » Cinnamon and Jacob Check Out Grandpas Work hit the nail on the head. I will be sure to return here regularly to find out what you have to express. You gained a visitor.